There is nothing like having a private valet service moving the cars of your special guests at your wedding. If you don't know where to begin that is perfectly acceptable. This guide was created to give you some information on valet parking and how to hire a private company to meet your wedding needs. A professional valet service will take some time to find and we have included a path in this article that we know will lead you to the perfect company for you. Begin looking at local private valet companies in your area. Use the internet to complete your search. Search engines are very helpful tools. When you start clicking on the websites of some area companies, you don't want to neglect reading the reviews. The reviews come from both current as well as former clients. If a company has various bad reviews, and thus a bad reputation you should not consider them an option. You should choose the companies with the best customer feedback. The better reviews a company has, the more likely you are to receive good service, as you deserve. Call the places on your list and get quotes, also check to see if they are available for the date of your wedding. If they exceed your budget, just move onto the next candidate on your list. Take your time when deciding upon a company. The fact of the matter is all of the valet companies are in competition for your business. Its important that you take your time and look around for the best deals. Doing so could save you hundreds of dollars, and who doesn’t love saving money! Once you choose a company you need to go over all specific details. Their job is to make sure that parking goes efficiently. Whether it is a dirt field, or a multi-story parking structure, everything should go over smoothly. The entire point of hiring a valet company is to offer your guests a simplistic way of parking. You need to determine where your guests will park and be sure that there is enough space for your guests to all fit. 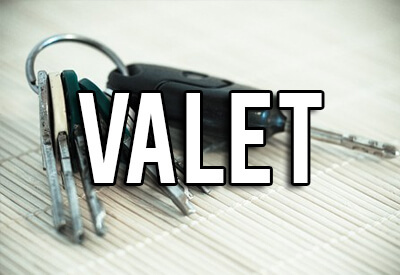 Make sure that the valet company has general liability insurance. It is also a very good idea to ask for driving records of the valets. You do not want anyone with a bad driving record parking your guest's car, it would be terrible if anything happened to any of your guest's cars. A valet company will likely require that you sign a contract and make a down payment. Make sure that you read over the contract in detail to make sure that it states everything that you agreed to when you talked with the company. Booking a private valet company is a wonderful idea, and can really save your guests the extra trouble of finding a parking space. And in the end, your guests are going to know how special they are to you because of this hire.